I was at the Office Store a couple of days ago and, as per usual, my sole purpose for being there was just to buy black ink for the printer and boxes full of resume paper. And there’s always something kind of embarrassing about that. Not quite as embarrassing as when you have to get medicine for your yeast infection out of the locked cases in the drug store and they call over the intercom for some inevitably cute guy to come unlock the little glass sliding doors on the “Bitchy Female Aisle.” But, you know, embarrassing nonetheless. 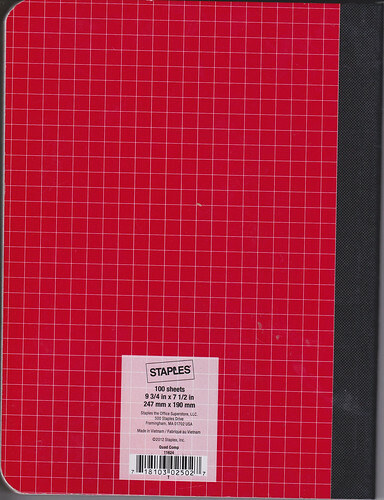 So, I decided on impulse to buy this red graph-paper-filled composition notebook. It wasn’t in the way of, “let me just add something else to my shopping cart so that it doesn’t look too sad for me to be there just buying stuff jobless people or women on their periods buy.” But I just fiercely wanted it, and it only cost a couple bucks. 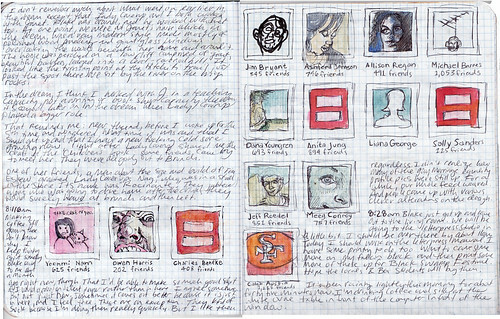 I have always loved composition notebooks but haven’t written in one in over a decade. 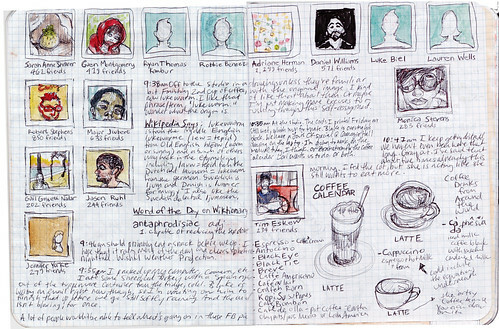 They’re like the fancy version of a notebook in my mind. Special. The Godiva chocolate of notebooks. As a kid, I spent countless hours drawing maps on graph paper of the wooded areas surrounding the old folk’s home around the corner, plotting each stream and special tree and other landmarks. I also spent hours being a “spy” in a very Harriet the Spy kind of way, except most of the time I just wrote down everyone in the neighborhood’s license plate number and developed secret codes that had different symbols for every letter of the alphabet. 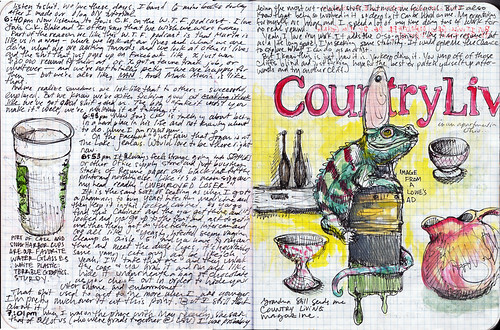 For these tasks, I always used composition notebooks. Seeing this composition notebook on the shelf brought both of those things to mind for me. 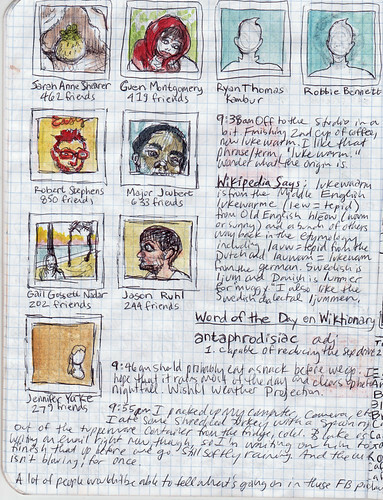 I’ve also been thinking lately about my grown-up version of “playing spy” that was a sort of email newsletter between K. Bozarth and I for a while and was even the name of my old blog: Stalker Noose. 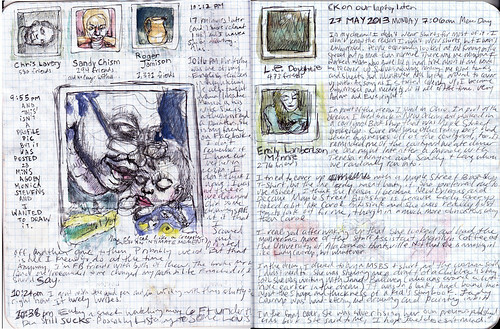 In addition, I just finished filling my last sketchbook, and this time I wanted some crappy paper to draw on. Sometimes I like dealing with the challenge of creating on bad paper. You have to collage and blot and work around the imperfections that seep through. 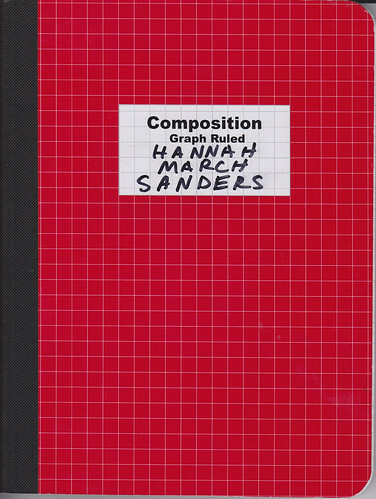 I also wanted to encourage myself to write more, and something about graph paper makes that fun. I’ve found that graph paper really helps me to draw ellipses faster, too. I don’t use it to measure things out methodically, but something about the lines already being there guides my sketches. 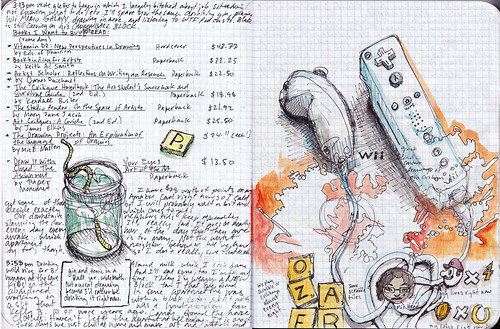 It turns my doodles into plans and maps. And it keeps me more organized somehow. It’s list-friendly. Half of my blog posts always end up being long-winded justifications for trivial things, and this one is no exception. Did I really need nearly 500 words to tell you why I spent a couple of bucks on a spur-of-the-moment purchase of a composition notebook? 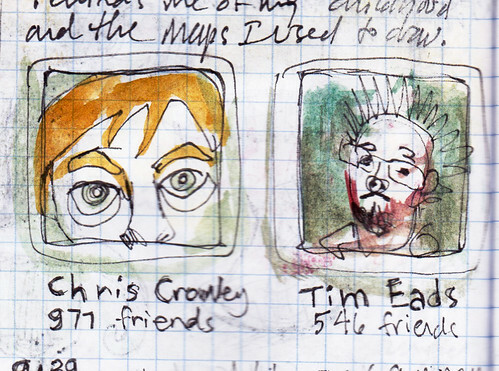 I meant to tell you that I have decided to draw the profile pictures of all of my Facebook friends. If I do 10 a day, I can complete the project in about three months. I’m ahead of schedule, which is good, because I’m sure I’ll be behind schedule soon. I’m doing them all very quickly and drawing them from the small versions of the photos as they show up in my list of Friends from my profile. Some of them turn out okay, some of them turn out terrible. I realize this project would have been a lot easier a couple of months ago when everyone had a red and pink = sign for their image. There are still a few of those around and a few of those generic white boy and girl silhouettes on a blue background. I’m drawing the pictures at random. 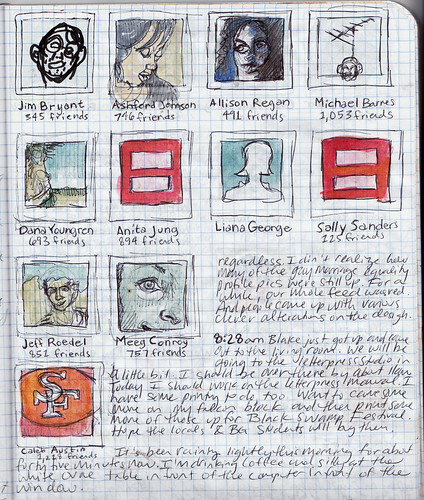 I browse through my list as it is generated each time (not sure what algorithm Facebook uses to decide who to put on top) and draw the ones I feel like drawing at the moment. I have found that I like the close-ups best, where the faces are cropped. This is probably because it’s hard to draw a whole tiny person on that scale. I also like the ambiguous landscape or object shots and the black and white ones. And I’ve started to notice themes developing among the faces. 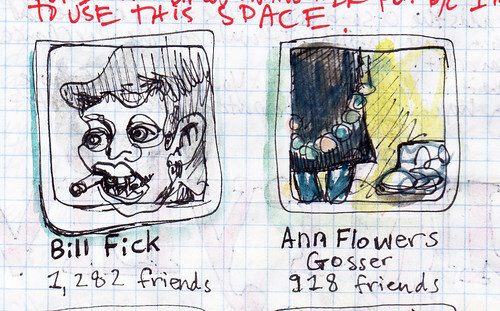 I’ve begun to theorize about friend count and personality. Some people are more well known. Some are more private. Certain ones purge their friends’ list every now and again. Particular jobs put certain friends in contact with more people. There are networkers, and there are those who take the meaning of “friend” very seriously, even on Facebook. Sometimes looking at the faces makes me remember a story about the person that I write in the margin. I feel like it’s good for me to go through all of these people. 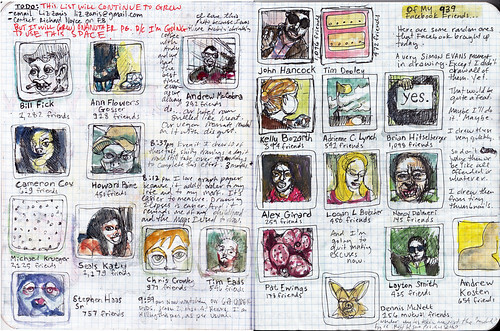 We all know that we don’t really know every one of our Facebook friends in a close, intimate friend way. Sometimes, it’s just networking. Sometimes it is people we would like to know or meet or get to know. It can be people we were once close to or people whose posts we just like to see. I’ve never really been bothered by this. I know Facebook is just for fun and keeping in touch, and we use it to promote our Orange Barrel Industries activities, too. I think it is good to take a break every now and again, though. And I’m glad I don’t have access to it all day on my phone. 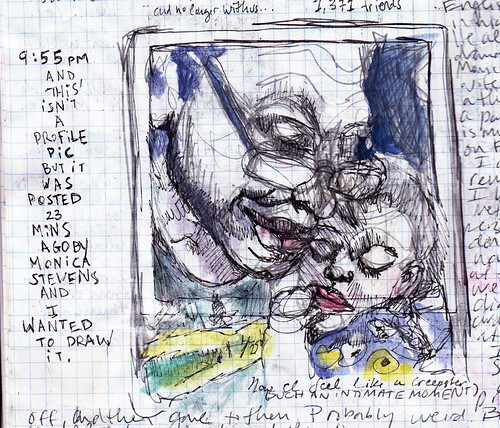 Perhaps this project will be a sort of self portrait, in the end. 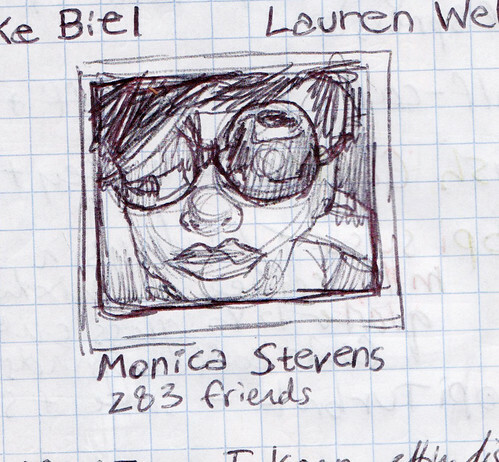 I draw myself by doodling out all 939 people I claim to know on Facebook.